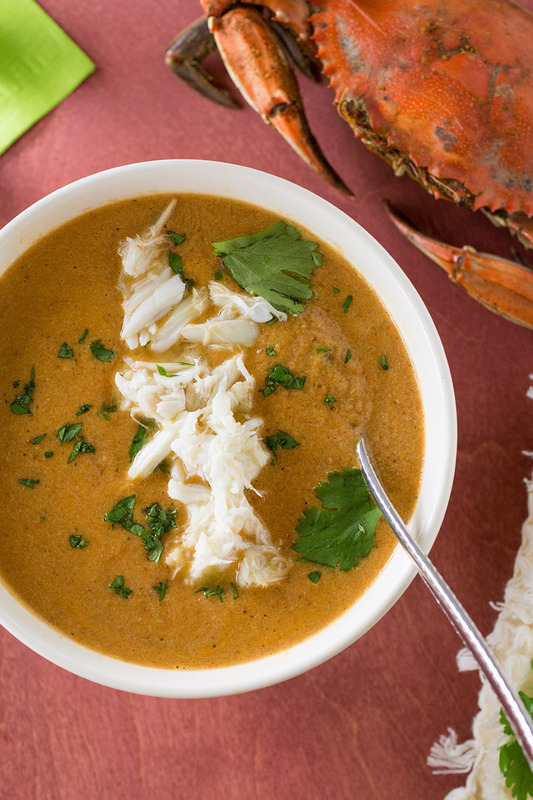 A recipe for velvety bisque made with roasted red peppers and blue crab caught directly from the Chesapeake Bay in Maryland during our anniversary trip. Let’s go crabbing! Patty and I recently celebrated our 20th Anniversary. I can hardly believe it. It doesnot feel at ALL like we’ve been together for more than 20 years. I sometimes feel like we’re newlyweds. I don’t know how she puts up with me! We decided to celebrate by traveling to the east coast of the U.S.. We love the east coast, with all the seafood and the gorgeous ocean and particularly the food. The last several days of the trip were spent in St. Michaels, Maryland, a historic town filled with Bed and Breakfasts, narrow streets and an influx of locals on weekend getaways. 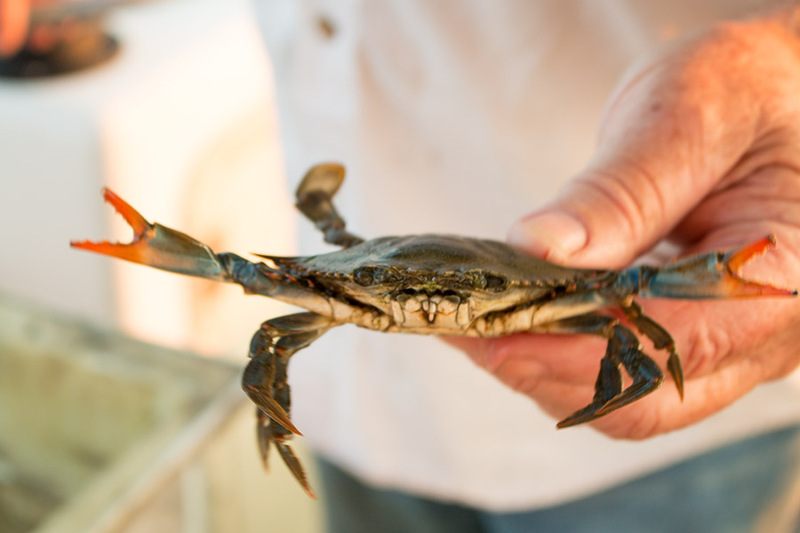 It is situated a few miles from the Chesapeake Bay, which is known for its abundance of oysters and blue crab. We chartered a crab boat out of Tilghman Island one morning and were taken out to sea by Captain Russell, a veteran waterman who spent his life on the bay crabbing and running a seafood company. When he sold his business and retired, he longed for the water so started giving tours where he teaches how crabbing is done in the bay. We had done something similar in Alaska many years back, and were both expecting to be hoisting crab traps up from the sea floor, but that’s not how they do it in the Chesapeake Bay. Instead, they use a trotline. A trotline is a heavy fishing line with bait attached every foot or so. The bait in this case were live clams in plastic mesh bags. Blue crab love to dine on clams. We dropped 3,000 feet of trotline with bait into the water, each end tied to a float. Captain Russell dropped a swiveled arm down the side of the boat and lifted one end of the trotline over the top with a hook. We motored slowly up and down the trotline all morning, with the line coming up and over the arm. The crabs would clench onto the bags as they tried to get at the clams and we stood waiting at the front of the arm with a net, catching blue crab. Here are some shots of Patty and me catching blue crab with Captain Russell. You can see the trotline running up and over the arm. Once you catch a crab, you pop it into a bin and set the net back to catch more. Interestingly, Captain Russell told us we were a bit early in the season and probably wouldn’t catch many crabs. He also said the crabs feed more in the very early morning so it was better to start around 3 am. Being a vacation, we felt that was a bit too early, so we didn’t leave until 5:30 am. We weren’t expecting much and were doing it more for the experience anyway, but Patty is something of a good luck charm. We wound up catching an entire bushel of crabs, 65 in total. Talk about a catch! Even Captain Russell said he was “tickled” that we pulled in such a haul. He was as shocked as we were. Look at all that crab! And that vibrant blue color of the shells. We couldn’t believe it. But then we realized, how the heck are we going to get this crab home? “It’s how the locals like it. We’ll hook you up.” Excellent! With our steamed crab, we purchased a couple foam coolers and filled the bottoms with ice, then set the crab inside and covered them with newspaper to capture the moisture. It was important to keep water from dripping over the crab, else the meat can toughen up. We drove our crab-filled coolers 900 miles back to Chicago and spent the next two nights picking crab. 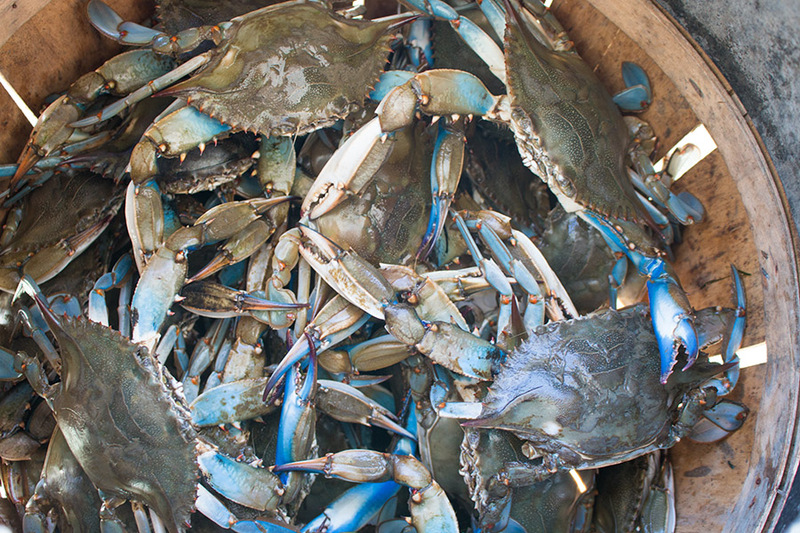 I have a lot of respect for all those crab pickers who pull the meat from the blue crabs. These are unlike the crab I’m used to, snow and king crab, with their meaty arms. Blue crabs don’t yield very much meat, and in the end, we wound up with 3.5 pounds of crab meat from the entire bushel. Here is what the crabs look like steamed. They lose their blue color and turn red like most crab you see. We froze most of it with a bit of milk, another tip from Captain Russel. He said his wife does the same thing and the crab meat tastes just as sweet once it is thawed and the milk poured off. If you’re going to trust anyone about crab, you should trust a 74-year-old waterman who’s been crabbing his entire life. With the remainder, I whipped up a batch of crab bisque. Mine is a pepper-centric version, of course, with plenty of roasted red peppers for a deep, rich flavor. I also set aside a number of shells and claws to make a quick seafood stock for this recipe, but if you’re going to make it, you can purchase stock from your grocer, or sub in chicken stock. It won’t be as rich with seafood flavor with chicken stock, but it will still be delicious. 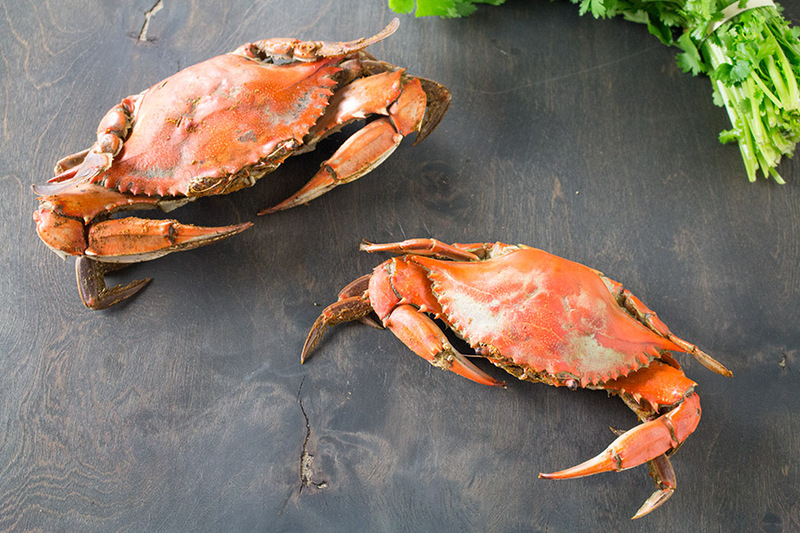 Also, you don’t have to go all the way to the Chesapeake Bay to catch blue crab for this recipe either. Grab a can and make it easier on yourself. But if you DO head to the bay, give Captain Russell a ring. He’ll be happy to help you! http://www.letsgocrabbing.com – Tell him Mike and Patty sent you! 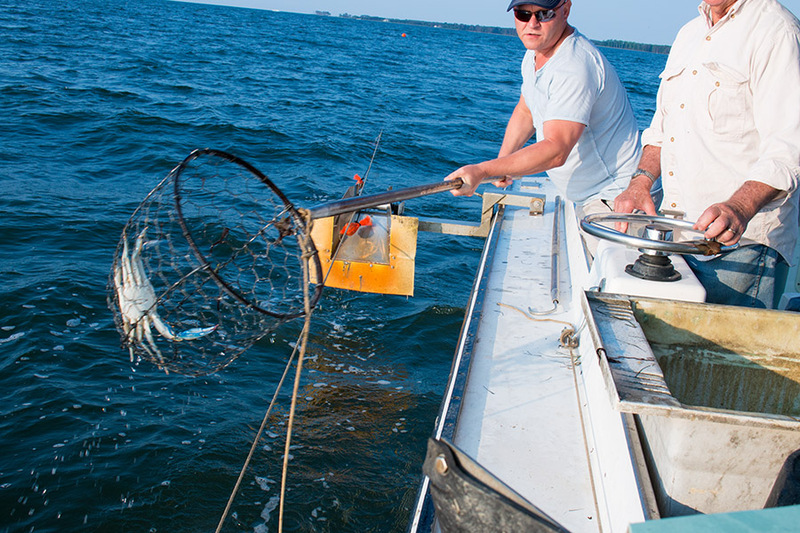 What a great experience to learn this unique method of crabbing in the Chesapeake Bay with a captain who has been crabbing his whole life. We were able to go through the entire process of catching the crab directly from the ocean all the way to the final meal. This bisque did not disappoint. Couldn’t think of a better use for all that blue crab. 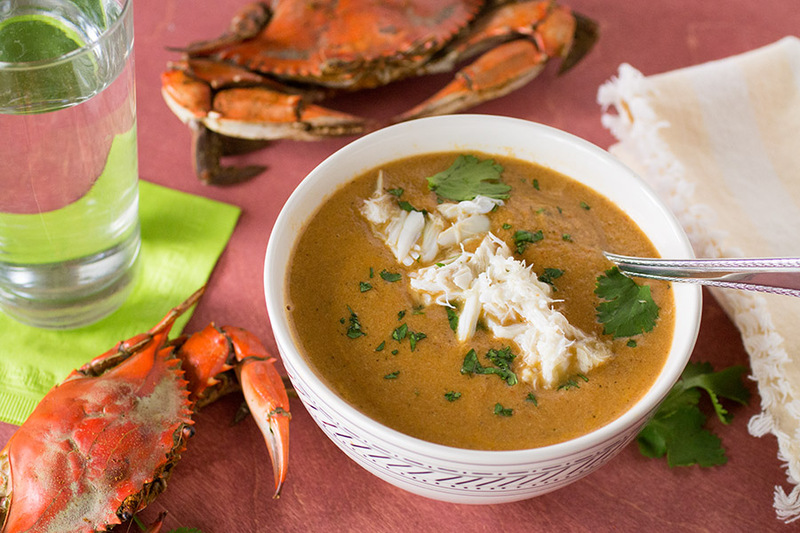 A recipe for velvety bisque made with roasted red peppers and blue crab caught directly from the Chesapeake Bay in Maryland during our anniversary trip. Let's go crabbing! To start, set your seafood stock aside along with the crab meat. If you’re making your own seafood stock, see the information above in the narrative. Heat a large pot to medium heat and add olive oil. Add carrots and onion and cook about 6-7 minutes, until softened. Add roasted red peppers, garlic and tomato. Cook another minute. Add white wine and allow to reduce by half. Add rice, chili paste, seafood stock, cilantro, basil and cayenne. Add salt and pepper to taste. Add about a pound of the cooked crab, reserving the rest for garnish. Stir and simmer about 30 minutes to allow the flavors to develop. Use a stick blender or food processor to puree the soup until nice and smooth. Add cream and 4 tablespoons lemon juice. Stir. Taste and adjust with salt and pepper as needed. Maybe more cayenne! Serve into bowls. Top with a bit of crab, a squeeze of lemon, and a bit of chopped cilantro. Enjoy! For Your Reference: How to Roast Chili Peppers. Use This for the Recipe: Ancho-Guajillo Chili Paste.